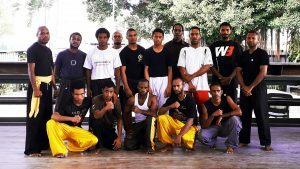 The Wushu Association of Papua New Guinea Kung Fu (KFWPNG) is the latest member of the Papua New Guinea Olympic Committee (PNGOC). KFWPNG was endorsed as a member during PNGOC’s Annual General Assembly which was held on June 30 at the Gateway Hotel in Port Moresby. The newly established sporting body has plans to expand its programme in PNG and thanked PNGOC and its members for accepting it as a part of its sporting family. President of KFWPNG, Geoff Hui said Wushu is a fascinating sport that is rapidly expanding in the world and the recognition by PNGOC gives it the motivation to grow in PNG. Modern Wushu was developed from traditional Chinese martial arts with competitions held in two categories, Taolu (forms or patterns) and Sanda (freestyle sparring). “We are targeting Sanda as the sport to develop in PNG and will be running our programmes in the coming months,” Hui said. Being endorsed as an official member of the PNGOC means KFWAPNG can now apply for support from the International Wushu Federation (IWUF) and its events recognized by PNGOC. The IWUF is interested in supporting the development of the sport in the Pacific including PNG and will be providing support through funding, equipment supply, technical expertise and scholarships for its members. While Sanda has its roots in Wushu and traditional Chinese Kung Fu, it is a flamboyant fighting style that features strikes from the hands and feet, clinches, throws and take downs. From the onset it looks like a variant of Western Kickboxing and has also been referred to as Chinese Kickboxing however, Sanda is purely a Chinese product. 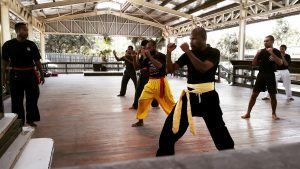 With the aim to make it a major combat sport in the country, the KFWAPNG is opening its doors to anyone who is interested to take it up. Hui said the Association is not limiting it to students and practitioners of Kung Fu only but is treating it as a sport and anyone regardless of their background can participate with proper training and coaching. 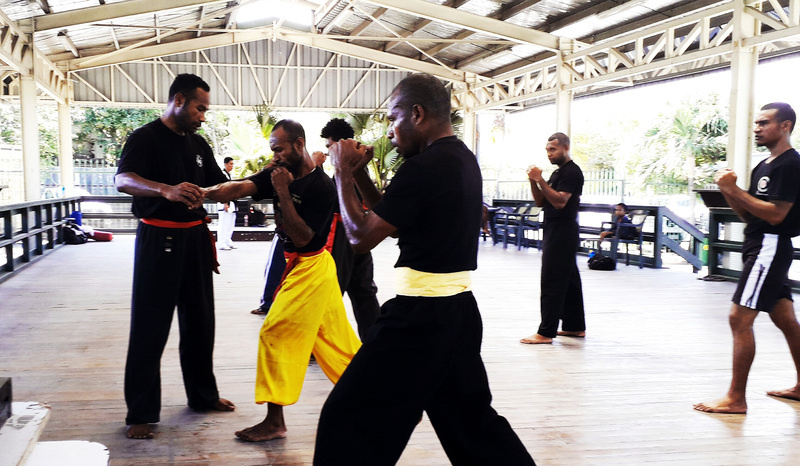 “We are not taking students or athletes away from other styles, they can keep practicing their style but just come for training and participate in Sanda tournaments for the chance to be selected to represent PNG,” he said. The Oceania Kung Fu Wushu Federation (OKWF) is aiming to make Sanda a sport in the Pacific Games programme and other regional games with the ultimate aim of one day becoming an Olympic Sport, a dream that is also shared by the IWUF. The establishment of Wushu in PNG brings the number of countries doing Sanda in the region to six. President of OKWF, Walt Missingham, congratulated Hui and his team for getting KFWAPNG set up and also acknowledged the PNGOC and its members for the vote of confidence. He encouraged KFWAPNG to carry out their work diligently and transparently according to the morals of good governance and the values of sports to develop and make their code a vibrant one. The Association has six clubs in Port Moresby, Alotau and Popondetta and it is inviting interested men and women as well as other clubs to join up. Sanda is a combat sport but those who are interested to take it up as self defense or for their fitness and wellbeing are also welcome. Anyone interested can contact the KFWAPNG Development Officer, Andrew Molen on email; amolen@oceaniakungfuwushu.com for more information.